I like to have turned edges on my appliqués because if the quilt is going to be used, it’s going to get washed, and those raw edges aren’t going to hold up forever. I even do this on my wall quilts because they need a wash from time to time too. I like my work to be as durable as possible! The pattern I’m using is one I made of waxwings, I’ve made it available to download so you can use the same pattern too and print at whatever size you want the finished waxwings to be, or you can draw your own design and work in exactly the same way. 1) First off, trace the design on freezer paper with a pen. You might want to create a key so you can remember what bit goes where. I just number mine and then use a letter to represent the colour, but do whatever works for you. I have extra shapes on mine because I’m adding background pieces. 2) You will also want to make marks on the lines between pieces to make matching them back up again easier- I use slashes and crosses. 3) Get your fabric scraps and use the picture to get the most accurate colours picked out. 4) Cut out your freezer paper pieces (if it’s a detailed design I do sections at a time so I don’t get totally overwhelmed and can see exactly what I’ve done) and iron onto the RIGHT SIDE of your fabric scrap, leaving enough space for a seam allowance all the way around. 5) Cut around the piece giving a generous seam allowance. I leave the first piece just like this with raw edges, however with the second you will want to clip up to the freezer paper on the edges that are going to join onto the first piece. 6) Glue the clipped edge under with a glue stick and then apply glue on the raw edge of the joining fabric to attach the second piece. 7) Continue with the next pieces, making sure you give a generous seam allowance of at least 1/4″ (unless it’s a sharp point, in that case you might want to trim it a bit more), clipping the edges where they are joining existing pieces, gluing under and then gluing the pieces together. 8) Once your design is together, you can pull away the freezer paper from the centre (“landlocked”) pieces if you have them and you wish to do so. Clip around the entire outside edge of the appliqué and glue and fold the outside edges under just as before to finish the edge on the entire design. Remove the freezer paper. You might even get an extra use out of these before they lose their stickiness! 9) At this point you can sew along the seams in colour matching thread or zigzag them with monofilament. 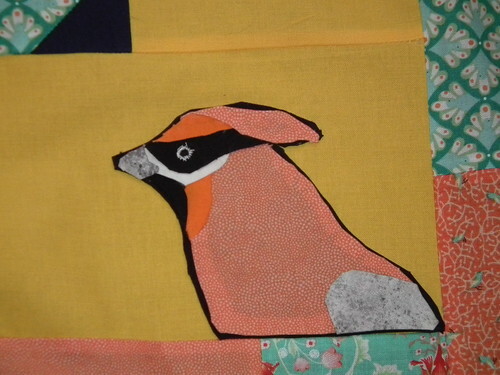 I am lazy and I know that I will be quilting over the design anyway so this is what I do. I trace the outside of the design THE WRONG WAY ROUND onto Bondaweb (a double sided fusible sheet). I cut it out and fuse it onto the back of my appliqué I can then remove the backing paper and fuse onto my project. 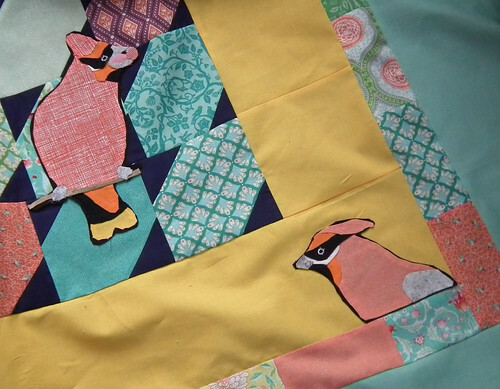 I then quilt over the appliqué when I’ve made my quilt sandwich by stitching over the seams and echo quilting as part of the design. My finished design (above) has an extra layer of black underneath the design to make it pop from the background and I machine embroidered the eyes on. Do whatever you feel is right for your project. I hope that’s been useful, let me know if you try it! Don’t forget my goody bag giveaway is still on until the end of Thursday 1st November! Previous post It's giveaway time!